Establishing a puppy feeding schedule for your new Weimaraner puppy will get her off to a good start. Feeding a puppy at regular times helps regulate your dog’s digestive system and keeps blood sugar and other things balanced. 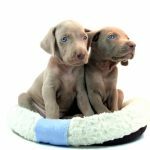 It is important to establish a puppy feeding schedule for your Weimaraner puppy as soon as you get your new dog home, and then stick with it. As a new pet owner you may be uncertain about healthy dog feeding guidelines. The good news is that feeding a puppy isn’t difficult, but using healthy food is essential. First of all, it’s important that your Weimaraner puppy is at least 6 weeks old when you get her. Ten weeks is even better. But if you wait too long, your puppy will have difficulty socializing with people and becoming part of your pack or family. 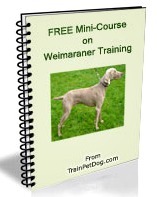 A puppy feeding schedule is healthy for your Weimaraner puppy. A puppy who is younger than 6 weeks is not ready to be weaned from its mother and her nutritious milk. And he is still learning things from his mother. Taking a puppy from its mother too soon, can cause stress for your puppy. Weimaraners are a sensitive dog breed, and being stressed can cause behavioral or health problems. 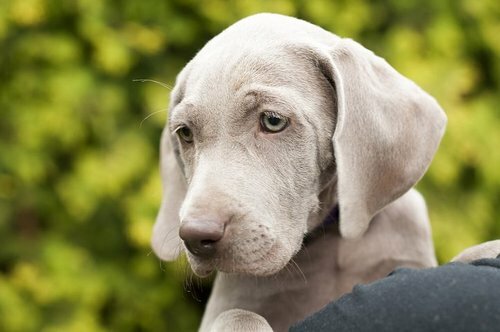 How Much Should You Feed Your Weimaraner Puppy? Of course, the nicest arrangement for your Weimaraner puppy is to have someone around all day to keep him company, feed him and walk him. But, since most new puppy owners work or spend part of the day away from home, your puppy may be alone for much of the day. If your lifestyle does not allow you to be at home all day, you will have to arrange for a neighbor or friend to attend to your puppy for a few weeks. If you work close to home, you can go home at lunchtime. Or you can pay someone to take care of your puppy while you are gone. This is not as simple as just feeding your dog and leaving in 5 minutes. 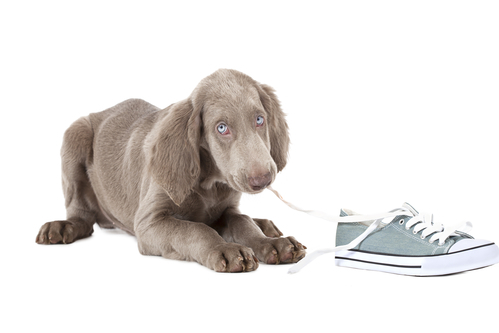 While your Weimaraner puppy is still little, the second the caretaker walks in the door, your puppy needs to come out of her crate and go outside immediately. Your puppy may have to be carried outside, to avoid an accident. Then the caretaker can play with your puppy, feed her and then walk her again before putting your puppy back in her crate and leaving. Puppies do not have the same bowel and bladder control as older dogs, so their needs must be considered. For example, when you first get up in the morning, you need to walk your little puppy. Before your shower, your breakfast, your coffee and brushing your teeth. After her walk, feed your puppy breakfast and then walk her again before you leave the house for work. Give your puppy a good quality kibble and put him on a regular dog feeding schedule to keep his digestive system healthy. Experts disagree on how often to feed a puppy. Some believe that you should feed your puppy three meals a day until he is 5-6 months old. Others say that feeding four times a day until the puppy is three months old is appropriate. Then three times a day until he is 6 months old. If you work, you may have to just go with three times a day until you reach the 6 month old mark. When your Weimaraner puppy reaches 6 months of age, you can reduce his meals to twice a day. Usually a puppy is fed early in the day, when you get up. The second meal is late in the afternoon or in the early evening. Make sure that there is still time to walk your puppy 30-40 minutes after eating and before bedtime. Feeding your dog on a regular schedule will teach her digestive system to work on a regular schedule. Free feeding, or letting your dog have access to food all day long, is not a good idea for dogs that are not house trained. Housebreaking could become a nightmare for you, if your dog’s need to pee or poop is unpredictable. During the house training period, feed your dog the same amount of food for each meal. Make sure that you feed your puppy large breed puppy kibble, as table food can upset her digestive system, resulting in vomiting and diarrhea. If your dog has a sensitive system, consider feeding her a dog food with pumpkin to prevent diarrhea episodes. At the age of two months, the average Weimaraner puppy eats 3-4 cups of dry food in a 24 hour period. Most pet parents do not give their dog the whole amount at once. Using a high quality kibble for puppies, give your new puppy 1/2 cup four times daily. This will increase gradually, over the first 6 months, so you will have to read the dog food bag to get the right amount, as your puppy’s weight increases. The first serving should be in the morning after you’ve walked your dog. Follow at even intervals (lunch time, 3 pm, and 6 pm) allowing your puppy to eat for about 10 minutes each time. It usually won’t take this long for your dog to finish her food. It’s very important to create a routine when feeding your puppy, as it will also help with successful crate training. In addition, your puppy will need two dog bowls–one for food and one for water. I recommend that you start your puppy with a slow feeder bowl for her dog food. The water bowl can be any bowl that you like. A slow feeder bowl will keep your puppy from gulping down her food quickly, one of the causes for dog bloat, a common problem with Weimaraners. Your puppy’s water bowl should always have water in it, and your puppy should be able to take a drink whenever she is thirsty. Around the age of 8-10 weeks your puppy should be ready for three meals a day. While the amount won’t change, you can adjust the timing so it better fits your family’s schedule. As before, you want to give the dog the first 1/3 cup portion in the morning followed by another 1/3 cup at lunch, and the last 1/3 cup at dinner. Following the pattern of having the last meal at the same time as your own dinner, will help your dog get through the night without your puppy’s needing to be walked in the middle of the night. A real plus! At six months of age, your Weimaraner’s meals can be reduced to two meals a day – half in the morning and half at dinner time. Continue feeding your dog puppy kibble until he is a full year of age, at which time you can switch to a high quality adult mix. Weimaraner puppies can be fussy eaters. If you find that your Weimaraner puppy stubbornly refuses dry food, it’s OK to moisten her food with water. However, do not give into the temptation to offer your pup human food or wet food. Kibble is by far the best choice for your dog’s digestive system and teeth. And using a kibble like a high quality puppy kibble will help insure that your Weimaraner puppy will not develop allergies to her food. If you do need to change your dog’s diet, do it gradually over a week or two. 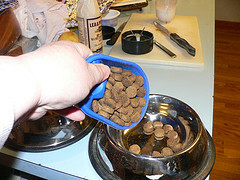 Start by adding a small amount of the new food and gradually add more new food and less of the original dog food. Eventually you’ll be feeding your puppy only the new food. Changing your dog’s food too quickly can give her puppy diarrhea. From time to time giving your dog a little carrot, apple, cooked egg or yogurt as a treat is fine. A healthy dog treat now and then is just fine. But do limit the extras, to keep your dog’s weight at a healthy level. By following these basic dog feeding guidelines, for your Weimaraner’s puppy feeding schedule, you will be supporting your puppy’s health and giving him the best chance for a very long life with you. Remember to be consistent in feeding your Weimaraner puppy, and use good quality kibble for the best results. Weimaraner puppy care is not really hard, and you will find it great fun to take care of your new little friend.